It seems strangely appropriate in the wake of Anzac Day which Australians claim as a defining event in Australian identity, to discover a book which explores steps towards identity in post-colonial Southeast Asia. Simone Lazaroo, in The Travel Writer (2006) tells a compelling story of Eurasian women and their search for love in a world where they are neither one thing nor the other. No dogs, durian, areca or patai nut allowed inside, the sign proclaimed in black lettering, in English, Malay, Cantonese and Tamil. She bought herself an orangeade from the lugubrious Malay man behind the counter and took it into the rustling twilight of the theatre. She sat on a canvas chair behind the more expensive padded seats preferred by the expatriates. The audience unwrapped ingeniously parcelled food. She had brought her own wrapped durian sweets, their flavour and odour contained by cellophane and sugar. The novel tells the story of Ghislaine de Siqueira, now dying in a London hospital, and her daughter, Isabelle. Ghislaine grew up in Malacca, transfixed by a dream of travelling elsewhere. In Colonial Malaya, England, and everything English, seems so much better in every way and Ghislaine yearns to escape the constrictions of her in-between status as a Eurasian in her racially divided homeland. She meets a journalist, Walter Humphries who promises much but delivers little, and so she eventually marries another expat called Rupert Balneaves. The social consequences of marrying ‘native’ soon impact on his affection for her, and her anomalous position leaves her floundering. If not for her child, Isabelle, and the wise women of her household, she would be totally alone. I’d been expecting someone lined and grey for a writing tutor, but there was a man who looked like a student, almost adolescent in his slenderness, his T-shirt emblazoned with a jet plane arcing over a map showing the great cities of the world. He was leaning back against the whiteboard, hands in the pockets of his jeans, watching his students leave at the end of their first class. He held his head to one side, as if considering something. A small gold earring glinted in his ear. His complexion came from somewhere sunnier. He looked just foreign enough to be my familiar. When I approached him, he smiled as if he recognised me. – Sorry I missed the class, I said, still catching my breath after running from the tube station. I no longer fall open at the pages the tutor marked in me. Only during moments of great fatigue, when I am lost even to myself, do I see the apparition of a man and a woman intrigued by the differences in one another’s skins and tongues. This man and this woman could be in England or any of its colonies, yesterday or more than fifty years ago. They mark one another’s bodies and words over days, months, years, as if making dictionaries or maps. It seems they are beginning to know one another, even to love each other. She learns to translate what is not spoken by him: that particular disinclination of his head, his wide range of smiles, that aversion of his gaze. But his silence spreads. She consoles herself with a song in her old language, one she learned from her mother. It helps fill the silence. But one day, finally, she listens to its words carefully. She heeds its warning about the dangers of clinging to the wrong kind of love. This is not unlike the transitions taking place in England’s former colonies across the globe: Lazaroo’s novel shows us also that a nation in search of identity can also cling to the wrong kind of love. Whatever is said in the popular media, I’m not entirely convinced that Australia had redefined itself as a nation on the battlefields of Gallipoli. Perhaps people no longer labelled themselves by their former colonial state of origin but even after Britain abandoned us and its Southeast Asian colonies to Japan in World War II, Australia was still a very British place to be in the 1960s when I arrived here. When Australian-born Prime Minister Robert Menzies in 1963 described himself as ‘British to the bootstraps’ he was doing no more than many other Australians would have done at the time, even though it was America that was our most dependable ally. And despite the value of that continuing alliance, perhaps we should also wonder whether we now have a wrong kind of love for America. Because in some ways, these days we seem to be absorbing American culture to replace our own. 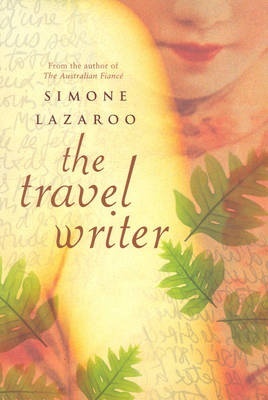 The Travel Writer won the WA Premier’s Award in 2006 and Simone Lazaroo also won it in 2000 for The Australian Fiancé – so that’s another one I shall try to hunt out to read in due course. I first discovered Lazaroo’s work when I stumbled across Sustenance at my library, and loved every word of it. Do read my review and then find yourself a copy while it’s still in print. Availability: Out of print. Try libraries, Brotherhood Books or AbeBooks. It is worth the hunt.